I'm trying to analyze miRNASeq data of TCGA melanoma (SKCM) samples. This is a prototype analysis in which I picked hsa-mir-155 and looked at how its expression is correlated with survival. My end goal is expanding this analysis to other cancer types also focusing on other miRNAs. I performed my analyses with two of the popular packages in R (RTCGA and TCGAbiolinks) and obtained quite different results. I'm trying to make sense of what might be causing the different results. Any help is appreciated. For comparison purposes, I'm attaching some figures and my codes as well. Overall Kaplan-Meier curves look quite different. These plots were generated on the whole cohort (unsegregated for any parameter). I'm including the plot from oncoLNC.org database as well for comparison purposes. RTCGA looks more like the oncoLNC curve. To understand what might be different in the datasets I exported the data from both packages and performed a comparison. Linked excel file shows the comparisons including clinical details (days_to_death and days_to_last_follow_up) and gene expression values of hsa-mir-155 (both read_count and reads_per_million_miRNA. I noticed that there are considerable differences between two datasets. I'm pretty sure, the way I organized the data is ok and I don't think the differences are due a mistake in data manipulation in R.
Please let me know why you think there is a discrepancy here. I'm pretty new to this type of analyses and hopefully, I didn't miss something silly. Alright, I think I figured out what's going on. RTCGA features an already preprocessed data frame with clinical parameters. In this data frame there is a times variable that combines both days_to_death and days_to_last_follow_up. That way you can provide times variable into the survfit() function and get the data in one step. In TCGAbiolinks data I needed to create this variable myself. Previously I overlooked this point, and I fitted the survival model only by using days_to_death variable. This effectively discards data from censored and alive patients skewing the results. 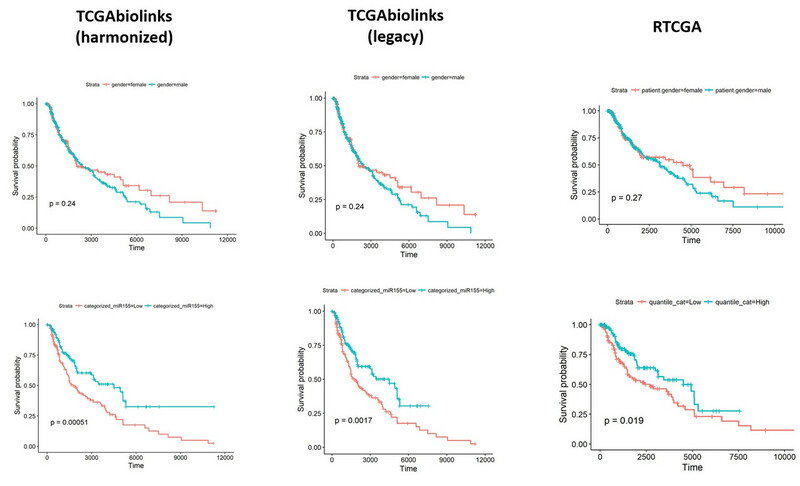 I also compared legacy and harmonized miRNA datasets by using TCGAbiolinks package. Results are shown below all side by side. As an example, two different parameters are plotted: patient.gender and hsa-mir-155 expression. harmonized and legacy data uses the same clinical annotation file, that's why gender plots look the same. With this realization, RTCGA and TCGAbiolinks are giving comparable results. Whew! Hello guys. 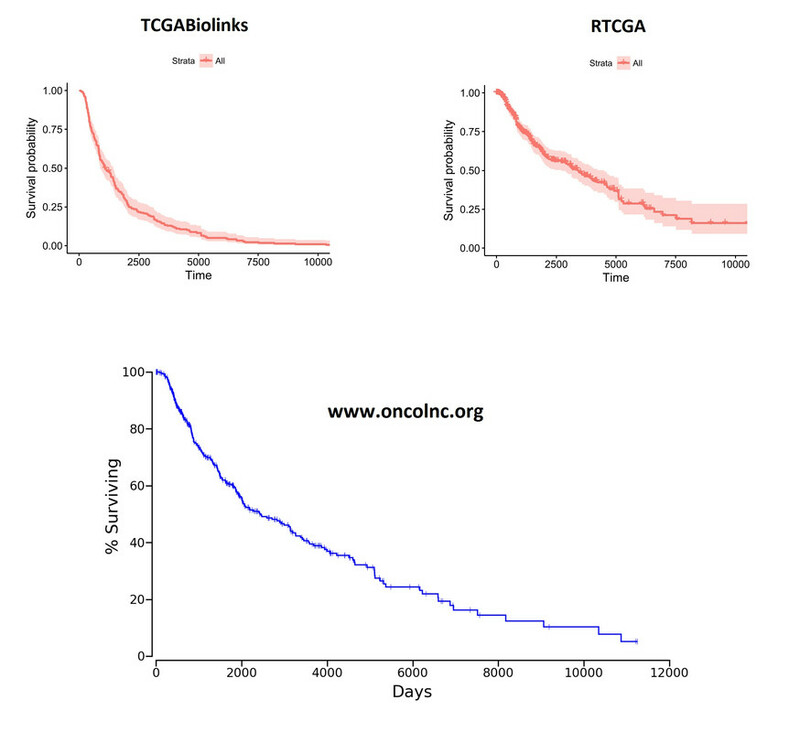 As you are both using TCGAbiolinks, perhaps you could assist here: TCGAbiolinks TCGA-BRCA RNA-seq clinical data ? I only used TCGAbiolinks once, a few years ago. Kudos ('well done') to you for exploring this. For many of the more experienced people here, discrepancies like this are not surprising. For newcomers, they can be quite surprising. The one thing that I'll say about the TCGA data is that it's constantly evolving, even though the main part of the project finished long ago. If I pulled all data for SKCM 1 year ago, processed it in R, and then did survival analysis, I have no doubt that I'd get a different result than if I repeated the same thing today. New samples may be added to the online repositories and/or clinical data may be updated with new information. If you look in your Excel file, you'll see discrepancies even on people who are alive/dead. Right now, the TCGA has been even re-ananalysing data, for example, much of the RNA-seq data. They refer to this as 'harmonized' data. This becomes more problematic when packages like TCGAbiolinks and RTCGA, which are 'third party' users of TCGA data, do not update their data. Thus, they invariably reflect a 'snapshot' of TCGA data that was taken during the release of these packages. This just ever more enforces the importance of version control and just confirms to me at least that i'm better off obtaining my own data direct from the GDC Data Portal or GDC Legacy Archive. Thank you for your answer. This was along the same lines as what I was thinking. The data of RTCGA is from 2015-11-01snapshot. If I'm understanding correctly, TCGAbiolinks downloads the most updated data directly from GDC. I used the harmonized data instead of the legacy version from TCGA to ensure the data pulled via TGCAbiolinks is up-to-date. Do you know if there is some sort of log of changes in different releases to trace this back? Also, can you please let me know about your approach for obtaining the most recent data from RTCGA for survival analyses? It's likely you'll find the changes relating to your work in the general notes. Looking through them, there are many references to the clinical data. Useful to have this. 1) Have you noticed differences and similarities about the genomes used ? the data that you retreive are in both cases harmonized/provinsional data or legacy-old TCGA ? also the preprocessing protocols are the same ? 2) The miRNASeq data you have analyzed is in the same "data ttype" ? for example RSEM counts ? 3) The segregation and subsequent clustering of patients based on the specific hsa-mir-155 you mentioned, is the same for both packages ? and i suppose that you separated the groups, for example based on the median value of this mir ? or something different implemented in the packages ? For example, TCGAbiolinks has 2 separate functions for survival analysis and grouping of samples based on a unique gene expression, etc ? 4) Are you certain that the same survival R packages and relative survival functions are used ? 1) TCGAbiolinks package fetched the harmonized data but I'm pretty sure RTCGA uses legacy data (from 2015-11-01 release). I knew this would potentially introduce variation, but didn't expect it would be this big. 2) Yes in both cases, I extracted reads_per_million data for survival analyses. In comparison file, I also compared raw read_counts and reads_per_million as well, and there were differences between two datasets in both cases. 3) I segregated patients based on the top and bottom third chunks. Numbers fell into these bins were similar (around 146 patients) give or take between approaches. 4) In both cases, I used the ggsurvplot function. So statistical fit should be technically the same. I really just used two packages to retrieve data in the beginning. Then I performed appropriate data manipulation steps to prepare the data to load into ggsurvplot function. I guess at the end of the day I expected not exactly the same, but similar results when I used these two packages. Apparently, these differences can throw off the analyses big time! yes, from your description above even only the difference in source data could change significantly the results-i mean for example, the harmonized data include more patients, as also keep in mind that the clinical data could have updates that could significantly alter the results-so, in my opinion i would definately go with the latest updates, based on the GDC resource. Moreover, i doubt that read_count and reads_per_million_miRNA are arguably the same, as if i understood these are belong relatively to the legacy and the other to the harmonized version ? Yes I think the main difference between RTCGA datasets and the ones acquired with TCGAbiolinks is that the former has the legacy version whereas the latter pulls out the most recent harmonized data from GDC. I will run the analyses with legacy data by using TCGAbiolinks and update here what I find. As for the read_count vs reads_per_million_data... You are right in that they are not the same at all. reads_per_million_miRNA is a within-sample normalized data type which takes the read depth/total read counts in account. For my analyses I think reads_per_million_miRNA is more appropriate and I used this type of data in both cases. Thanks for your insights! 1) The main difference is potentially caused by the utilization of harmonized data (via TCGAbiolinks) vs legacy data (from RTCGA). I will run the analyses with legacy data downloaded with TCGAbiolinks package and will see how it will affect the results. 2) My survival fit takes only days_to_death into account but not the days_to_last_follow_up in the case of alive patients. I must have missed this previously. My survival plots are likely to be underestimated since censored alive patients won't be showing up due to NA values in their days_to_death column. This might also have potentially introduced variation into the analyses since, in harmonized data, follow-up times were longer than the legacy data. 3) Still unknown is why we are having different read_counts per gene of interest in miRNASeq data. This number shouldn't be affected by the normalization steps that the harmonization pipelines might introduce. I will update this thread with new findings in a day or two. Hi Atakan, thanks for the follow-up. I was not aware that TCGAbiolinks is still being updated, but that's good to hear. On the final point that I make, TCGA appear to have been re-processing all RNA-seq samples in order to produce RSEM 'raw' cunts, which is good. Prior to this, there were different count types available for different cancers, depending on where the work was done. Same transcript appear on different scaffolds. Why?